Etsy Inc. (Nasdaq: ETSY) stock hits the market tomorrow, April 16. The peer-to-peer e-commerce company is one of the most talked about IPOs of 2015 so far. With the possibility of becoming the largest New York tech IPO since 1999 by raising $250 million, people are wondering, "Should I buy Etsy stock?" Etsy Inc. (Nasdaq: ETSY) set a price range of $14 to $16 and will announce a final IPO price this evening. The company will offer 16.7 million shares and hopes to raise $250 million. Founded in Brooklyn in 2005, Etsy's founders originally used it to sell their handmade wooden crafts online. The company now allows users to buy and sell a wide range of items, including art, photography, jewelry, food, and toys. Bloomberg reported that the Etsy IPO will put "New York tech back on the map." The deal is turning attention away from Silicon Valley toward the New York startup scene. The last tech company from New York to raise more than $250 million was Barnesandnoble.com during the dot-com bubble. The only other New York IPO to come close was OnDeck Capital Inc. (NYSE: ONDK) last December, which raised $200 million. Etsy has a B Corporation certification – an award companies receive when they meet certain social, environmental, transparency, and accountability standards. The company fulfills its certification by offering employee privileges like bikes for commuting to work and food waste composting. Etsy will be the largest B Corp. company to ever go public. Etsy's sales have gained momentum in the last few years. The company posted $195.6 million last year, a 56.4% increase from 2013. Etsy merchants sold $895.1 million worth of items in 2012. That number soared 116% since then, hitting $1.93 billion in 2014. But those strong numbers shouldn't send you running toward ETSY stock. 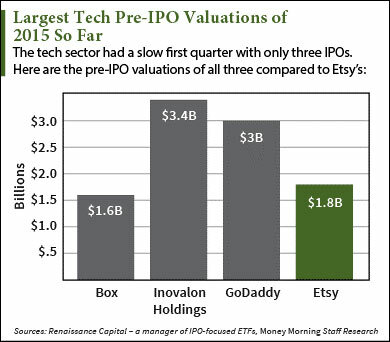 Should I Buy Etsy Stock After the IPO?